Trimaco understands that surface protection isn’t just about protecting against spills and stains. Our collection of dust containment systems and solutions will protect against all kinds of dust, including airborne dust, combustible dust, silica dust and more. When combined with our protective films and plastic sheeting to create dust barriers, you get a complete dust containment system. 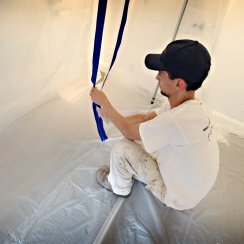 The temporary walls suppress dangerous dust particles, protect surfaces, and help maintain proper air quality. From large scale construction jobs, to residential renovations, Trimaco’s Dust Containment Solutions will keep your space safe and clean. 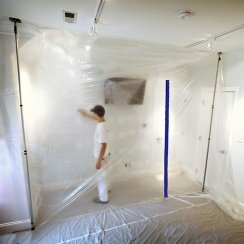 Looking for other ways to keep your job site protected from dust and debris? Check out Trimaco’s extensive line of Heavy Duty Surface Protectors and Masking Products! 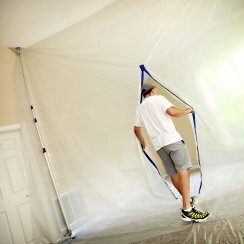 Use 12ft poles with plastic sheeting to create a temporary wall for blocking dust. Use heavy duty poles with plastic sheeting to create a temporary wall for blocking dust. Create an instant doorway in and out of the work space with our zipper and plastic sheeting. Carry up to 4 containment poles in our heavy duty bag with reinforced zipper and straps. Create an instant door with our unique C-shape zipper, allowing for quick access in and out of the jobsite. Our double-sided tape provides a tight seal with plastic sheeting and features release paper for easy application.